TIRANA, Apr. 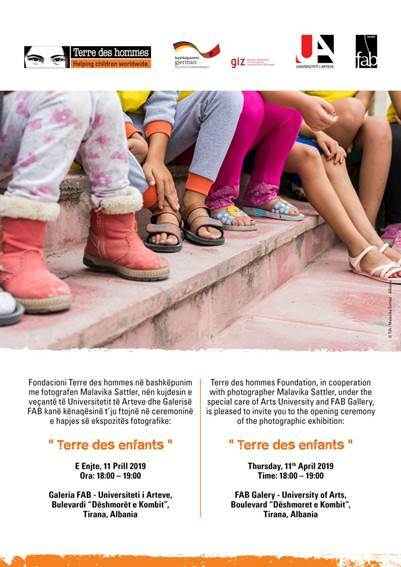 11- “Terre des Hommes” in collaboration with the University of Arts presents the work of photographer Malavika Sattler and the works of the University of Arts’ students in an exhibition which aims to reflect on how art can be used by young people and children to bring about change in issues related to them, and how it affects their empowerment, development, and involvement. The exhibition opens on April 11 at 6 p.m. at FAB Gallery near the University of Arts campus, and will remain open until April 15. “Terre des Hommes” (Land of People or Land of Men) is an international children’s rights charitable humanitarian umbrella organization under the aegis of the International Federation of “Terre des Hommes” (TDHIF), with independent organizations in Canada, Denmark, France, Germany, Italy, Luxembourg, the Netherlands, Switzerland, Spain, and Syria. It was founded in 1960 by Edmond Kaiser in Lausanne, Switzerland. The organization is named after Antoine de Saint-Exupéry’s 1939 philosophical memoir Terre des hommes (English title: Wind, Sand and Stars). An important part of the TDHIF’s work is as a consultant to the United Nations Economic and Social Council (ECOSOC). Promoting the Convention on the Rights of a Child is an important activity of Tdh. Advocating for children’s rights, defending them, and spreading information are tasks which “Terre des Hommes” – to the aid of children considers a priority. TDHIF runs the two campaigns ‘Destination Unknown’ – Children on the Move (www.destination-unknown.org) and ‘Children Win’ – Changing the Game of Mega Sporting Events (www.childrenwin.org). This charitable organization started its activity in Albania in 1993 focusing on combating child trafficking, abuse, neglect and exploitation and on developing the child protection system, and later in 1999 during the Kosovo war they provided emergency assistance to refugees in Korça, including food aid, hygiene kits as well as psychological and social support. “Albania has seen considerable positive changes in child protection in the last years. However, too many children are still exposed to the risks of migration, trafficking and abuse. Our aim is to ensure that they are effectively protected and their rights are respected. To achieve this, we work in close partnership with government institutions and communities,” writes “Terre des Hommes” in its website. The website lists some achievements from their 2017 activity in our country, such as 8500 children have taken part in their after-school psychological activities during 2017, 4800 parents participated in economic empowerment and health promotion projects, and 1100 professionals were trained to provide better child protection services in 2017. The organization supports child victims of abuse and identifies those at risk, by contributing to improving the child protection system in Albania and offering training and networking opportunities to professionals, and empower local organisations through grants and mobilisation activities to develop initiatives for child protection. They also help parents set up an income-generating activity, encourage children to attend school or to undertake vocational training and offer them after-school activities either to prevent emigration, or for families in the move. The organization is also building youth resilience through an innovative approach at community level in order to combat violent extremism among children, which is mainly caused by difficult socio-economic conditions, lack of education opportunities, and isolation. They work with youth activists, local organisations and authorities, and train them on conflict resolution and leadership, offer grants to support grass-root initiatives to empower youth, and support youth in becoming agents of change by undertaking on-line counter-narrative campaigns. And lastly, they are supporting ongoing reforms in Albania’s health system so particularly marginalised and vulnerable groups can access quality medical care. As part of a consortium of three organisations (STPiH and Save the Children), the organization carries out health promotion campaigns for children and parents, establishes training courses and a Master degree for primary healthcare professionals, rehabilitates the existing health care infrastructure and equips health centres and their staff with adequate instruments to work. There are currently two ongoing projects from “Terre des Hommes” present in Albania, the “Regional Child Protection Hub for Southeast Europe” which is a network for child protection professionals in Southeast Europe; and “Reintegration of returned migrant children in Albania and Kosovo” which aims to improve the reintegration of returned migrant families in Albania and Kosovo and to prevent unsafe migration.